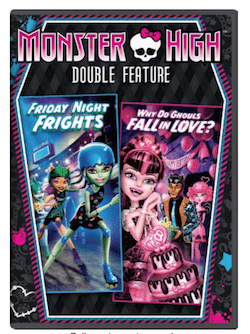 The Monster High Double Feature DVD– Friday Night Frights and Why Do Ghouls Fall in Love is on sale right now for $3.99 at Amazon. That's 73% off the list price of $14.98! Movie Synopsis: The Monster High ghouls are back in a freaky, fabulous double feature that’s simply to-die-for! When the boys can’t compete in the Skulltimate Roller Maze Championships, Frankie Stein convinces her friends that some “ghoul power” is needed to save the day in the creeptastic, all-new movie, Friday Night Frights. Then, as the epic Sweet 1600th of Draculara approaches, she’s got two crush-worthy guys out to steal her heart (literally) before the big event in the new-to-DVD movie Why Do Ghouls Fall in Love? Get double the dose of ghoul school with these two, fangtastically fabulous adventures – tricked-out with skullastic style and spooktacular laughs!